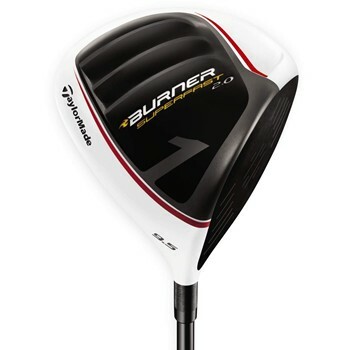 The TaylorMade Burner SuperFast 2.0 driver features a 460cc titanium head with a longer shaft and lighter overall weight of only 279 grams to produce faster clubhead speeds, resulting in longer drives. Its aerodynamically enhanced design removes the Dual Crown appearance in favor of a rounded crown that reduces drag and lowers the sole for optimal launch angles. 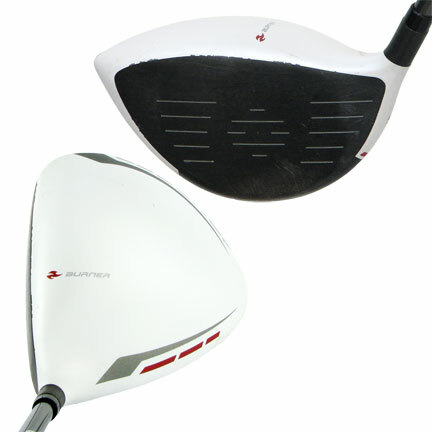 It also features the largest face (4550 cubic mm) that TaylorMade has ever produced for additional forgiveness. The flat white crown reduces glare and allows for improved alignment, resulting in more accurate drives. In order to determine if the shaft has a soft or medium tip. you would want to refer to the specific shaft that is in the club and its specs. Shaft specs can typically easily be found by going to the manufacturers website. 69 out of 73 people found this review helpful. great distance and control! the only bad thing is you can see every scratch and dirt mark. but added 40 yards and drew the ball instead of slicing it! awesome club! In our foursome 2 of us have last years Black Superfast and the other 2 have this years new white Superfast 2.0. 2 are 10.5 R Flex for each year and 2 are HT Senior Flex for each year. We hit the range the other day with our club pro, a laser range finder and Pin Flag and staff to measure out the results comparing the 2 different years model. Dead calm day and we measured out with the laser the complete yardage carry and roll. First it was going to be just the 5 of us, well by the time we got finish some of the other guys on the range came over and tried out both clubs, a total of 20 different golfers.The deal was each guy had 5 warm up balls with each club and then we used the 3 best of the next 5 hits for test results. End result is the only noticeable difference is one driver was white the other black. Distance and dispersion was not really different. That's not to say this is a bad driver, quite the opposite this driver gave each hitter 5 to 15 extra yards over their current driver. Getting the right flex and then keeping your swing speed within your abilities will give you great results. But Taylormade wants all their black head drives off the shelf, everything is going White in their line. So save some money and get last years Superfast, they are as low as $129 to get them off the shelf. The Pro Shop Manager said that after the big sales TM had with the White Ghost Putter last year, they carried over white to everything, and maybe soon the back side of Burners will be all white also. Why white? Real simple, most mens drivers are black. While you may have a TM hardcover on your driver once its off the Club Black = old design and technology, White = new design and technology. And for the guy that has to always one up his buddies he can't get by with Black. In essence the new White is more a marketing tool, it has no effect on the club other than color. And the more aerodynamics design may show a difference in a wind tunnel test but not on the course. We used the pro's Doppler and swing speeds ranged from 67mph to 127mph. The 4 hitters that were over 110 got hooks or slices, not the fault of the club, we just didn't have the stiffer shaft which this heavy hitters needed. This Driver not only looks good, but it gives you great distance. The only bad thing about the driver is that the shaft in the club is too long. Other than that this is the driver to buy. I am by no means a good golfer, I usually score around 30 over par. Lately I have been improving my game by practicing and fixing my swing rather then over correcting and playing my slice like so many people tend to do. I was passed down clubs from my father and the driver while it is very powerful and a great club, is the opposite of forgiving. After much research and trying some out, I made the jump to this driver and played it today for the first time. I immediatly felt the difference! This club is so comfortable and swings so well, my drive is straighter and it has the ability to crush the ball very. If you are in the market for a new club or just want to try one out I highly recommend this club, im extremely happy I bought one.